The Rollei Bullet HD is a new all-action camera weighing less than 100 grams and offering 720p video. Protected by a robust aluminium body, the camcorder is guaranteed dust-proof, impact-resistant and unsusceptible to vibrations. The Rollei Bullet HD will be available from late July 2011 for € 249.95. - Extreme applications with the Rollei Bullet HD! - Extreme conditions ? Rollei title sponsor of the Windsurfing Freestyle 2011 German Championship! Hamburg/Germany, 30 June 2011 Following the Rollei ActionCam 100, Rollei is launching its second action cam on the market with its Rollei Bullet HD ? for all demanding action-seeking athletes and outdoor fans. This high-definition camcorder, sporting an elegant and timeless aluminium design, boasts a resolution of 1280x720 pixels and shoots up to 30 frames per second. One-button operation: The video recording function is operated with a simple press of the power button, which has an LED. This button is also used for switching over between photo and video mode. Never miss another shot: Every action is recorded, thanks to an impressive super wide-angle lens of 170 degrees. Weighing in at less than 100 grams (83 grams without battery), this camcorder is an absolute lightweight. The “Auto Snap Shot” function allows the camera to take a photo automatically every 3 seconds. The high-quality shots taken by the precision lens are processed by a CMOS sensor. Using the settings options of the Rollei Bullet HD is child’s play. Protected by a robust aluminium body, the camcorder is guaranteed dust-proof, impact-resistant and unsusceptible to vibrations. Whether out surfing, mountain biking or bungee jumping, the Rollei Bullet HD becomes a constant companion. Thanks to the water-proof body, the camera even permits dives down to a 10 m depth. This “compact all-rounder” (dimensions approx. 90x30x10mm) is utterly reliable: a built-in rechargeable lithium-ion battery lasts for up to 2 hours and it takes memory cards (Micro- SD/Class 6) that hold up to 32 GB. Rollei is the title sponsor of the freestyle discipline of the German Windsurfing Championship. The official title of the event organised by Choppy Water GmbH is “Rollei Bullet HD Freestyle German Championship 2011”. In the run-up to the event, Rollei is offering 4 freestylers the opportunity to test the Rollei Bullet HD themselves. Anyone wishing to win their own “signature clip” plus Bullet HD camera must apply by 22 June 2011 by e-mail (info@choppywater.de) with action-packed videos, photos and results to our partner, Choppy Water GmbH. Further information about the Rollei Bullet HD Freestyle 2011 German Championship can be found at www.windsurfcup.de and www.choppywater.de. Freestyle is the supreme discipline of windsurfing. Featuring high jumps, extreme tricks and outrageous loop the loops, this is undeniably the most spectacular windsurfing discipline. To provide the perfect stage for such an event, you need a suitable setting and the right conditions. This also includes at least 6 wind strengths. Hence the reason why the event is held as a standby event during the period from August to September 2011. The Rollei Bullet HD Freestyle German Championship will get underway as soon as the wind forecasts predict good conditions. Specially for the sales pitch to retailers, Rollei is offering a Rollei 7 inch digital picture frame showing a Rollei Bullet HD action video recorded with the Rollei Bullet HD. In addition, Rollei also supplies a helmet to which the Rollei Bullet HD is attached. The helmet complete with camera is displayed mounted on a polystyrene head for better illustration. A 4 GB Micro SD memory card that comes with the camcorder saves the first videos or photos taken, allowing it to be used immediately. Attachment to helmets, ski goggles or handlebars is possible using the supplied holders. A 360 degree universal holder can be attached to virtually any object. In addition, Rollei supplies a bag, a USB cable, a mains adapter, a sealant and a built-in lithium-ion rechargeable battery. 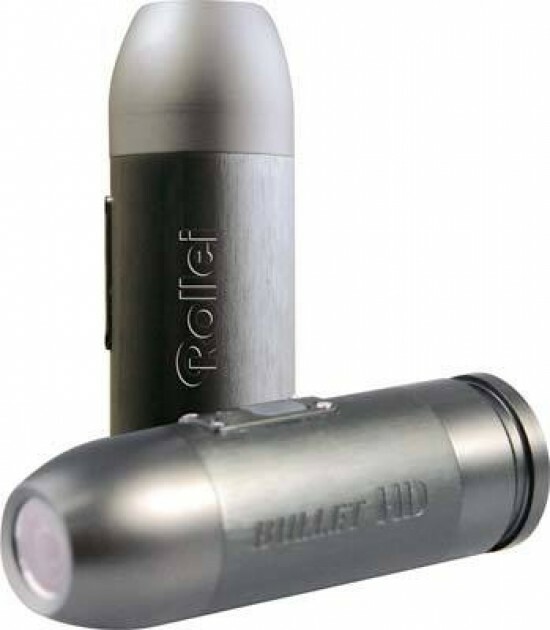 The Rollei Bullet HD, in an aluminium body, will be available in shops from late July 2011 for a RRP of € 249.95.